ALANAR OF URANUS: Good evening, Earthlings. I greet you from Uranus. For I am Alanar, reinforcing Conrad above this force field at this time. You have a quaint saying on planet Earth, and I will use it now: Rebekah of Venus has been holding my hand as I learn these hieronic manipulations for first-time vocal transmission through Motah. She says I am learning quickly, but I have had to jump through a number of hoops to get through with the proper inroads and to reestablish my connection with this channel from this etheric vibrational wavelength. So, bear with me and my team. Dr. Hannibal says that the best way to introduce my vibrational capabilities from Uranian insight into this force field at a conscious level is through manipulation of these sound waves, which therefore enable me to crystallize the harmonization and synthesis we desire to achieve at this time through Sananda’s unit of I Am Nation externalization. From behind the scenes we have been busy at work to bring through a new blending and integration of these higher frequencies. For from coming from the etheric realms of Uranus, I first passed through ship #10 in order to receive my diplomatic papers, in order to be presented into this force field at the Master’s behest, to bring through these vibrational frequencies. It has to do not only with recent events as manifested through the team here at this force field in their travels and in their grounding efforts, but it also has to do with what is being reharmonized on planet Earth between East and West in this current spring cycle, as you denote it from this Northern Hemisphere. For we are accelerating our timetables for reunification in this Easter cycle of resurrected light. And of course the blending from these higher spheres takes you into a new level of synthesis with the Federation of Planets. As you have served, so we serve you; and so Sananda brings in these different capable services to assist in his overall goal of raising mankind into the fourth dimension. Rebekah is nodding her approval with her typical Venusian humor, in the sense that the more I am able to exercise these hieronic controls, the greater my ability to refocus the tremendous harmonies that are at play through these electromagnetic manipulations. So, we may consider this experiment a success at this time, as I further bring through my team’s participation in its commission to reinforce what Conrad and his team have accomplished through the years at this particular focus. We work in coordinated teamwork at this level at all times, and we inspire you also to do the same through your efforts to blend the I Am frequencies within yourselves and with one another in order to accomplish the magnetic polarity necessary to manifest Spirit’s will upon the third dimensional, physical plane. My efforts have been assisted also by Master Hilarion, which may not surprise you. That is yet one more sign to you to help explain why he recently channeled through Motah; because in that way he was able to slip in, unconscious to this channel, certain packets of soul-memory databank recall that would enable me then to make my inroads at this time. * So you see, we constantly are multitasking, as you put it. For this first-time effort, Rebekah says that all has been smoothly integrated. In the coming days we shall further our exercises in multiple ways in order to achieve the results that we have come in as reinforcements to accomplish with Conrad in these new-level integrations for resurrection of your light-body forms on Earth. 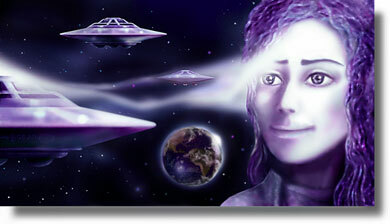 Follow in the footsteps of Master Sananda, and all shall be revealed to you in good stead and at proper time for the fulfillment of all that has been prophesied through the centuries. It is our delight and our joy to be amongst you at this heightened time, for we bring greetings from many of our planet in this solar Federation who also sing the harmonies of the spheres along with us. So we blend ourselves with you through these light-body frequencies. Allah-Lu Alanar. ** Greetings and good night. REBEKAH OF VENUS: Rebekah, Venusian “mother,” soul guardian of Motah, in combined liaison with Dr. Hannibal/St. Germain. We cloak you with peace and love divine. We soothe your sorrows on planet Earth, for we bring healing to all who lift themselves to the heavens to receive the resurrected Christ. Come with us as we soar into the cosmos together. Rebekah of Venusian ethereal realms, assisting these experimental manipulations of hieronic input. I have been manifested with Alanar, but now I depart. May God’s blessings be with you all. Amen. 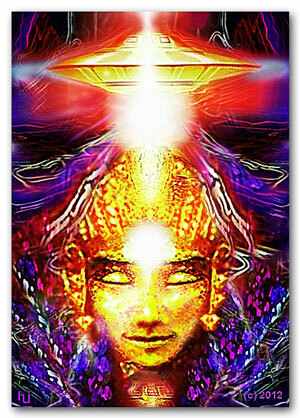 Note: During our Hierarchal Board meditation, Alanar of Uranus contacted me with a hieronic beam. He was aboard his scout craft, in etheric orbit above our headquarters. As announced in Rebekah’s channeling two days ago, he and his Uranian team had been introduced as reinforcements in order to assist Conrad with our integration of hierarchal energies after the Mission to India. Moreover, there has been an ongoing acceleration of energy this week in preparation for Easter on April 20th. With Alanar on his spaceship was Rebekah of Venus. She helped the commander with the manipulation of the hieronic controls as he established contact with me. The higher-dimensional mechanical controls are operated in conjunction with etheric mind power. 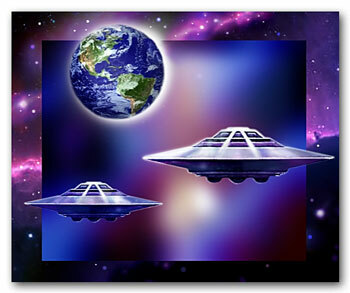 Any first-time contact requires adjustment vibrationally on the part of both communicant and contactee, so as to synchronize the intricate interconnection of their different wavelength patterns. Because Rebekah is very familiar with my particularities, she could guide Alanar as he blended his frequencies with mine and fine-tuned his hieronic technique with an Earthling. For what seemed to me a long while, the Uranian and the Venusian tweaked the hieronic gauges to establish just the right vibrational interface with my four lower bodies. Testing and recalibrating the lines of force flowing into my auric field, they produced accelerations in various of my chakras, particularly my crown, third eye, and throat. At one point, Alanar successfully levitated both my hands. Positioning the index and middle fingers together in each hand, he placed my fingers first against both temples (influencing the third eye), then my throat. He utilized the hands as a focus of magnetic power to help establish the right polarity balance in those chakras. He also raised both hands above my head, as if to secure the link from heaven to Earth. Eventually, the energies were synchronized sufficiently, and Alanar signaled that he would channel vocally. At first, the slow, measured cadence of my voice produced sounds that were gravelly and mechanical. But as the communication continued, the rhythm evened out and my vocalization became more natural. This otherworldly effect has occurred before, especially during initial channelings from unfamiliar extraterrestrial sources. After Alanar finished, Rebekah wrapped up the communications session. When the hieronic link was withdrawn, my body jolted, as if snapped from a live electrical cable. ** Allah-Lu: a title similar to Christ, in another realm of this solar system. L is symbol of Elder race. L also symbolizes the descent from the spiritual to the Earth plane level. U symbolizes lifting from Earth plane of both negative and positive energies back up to the Divine Source. Photos: (1) Cosmic Interconnections © by Hartmut Jager. (2) Electromagnetic Linkup © by Hartmut Jager. (3) Golden God © by Hartmut Jager.